The ban on endangered wildlife in Chinese medicines has never been enforced with any commitment or conviction by the Chinese authorities. Now China is partly lifting the largely unenforced ban on rhino horn and tiger bones in traditional Chinese medicine (see New York Times article at https://www.nytimes.com/2018/10/29/world/asia/china-rhino-tiger-poaching.html?smtyp=cur&smid=tw-nytimes). The fact that these products, like pangolin scales and many others, have no proven medicinal properties does not seem to deter the growing number of users who presumably get some placebo effect enhanced by the conferred status of being able to afford elitist medication. Chinese traditional medicine is said to be a US$ 100 billion industry. The Chinese government has identified this as a growth industry, to compete worldwide with Western scientific approaches to medicine – particularly in Africa. If this is the case, we can expect the demand for such Chinese traditional medicines to grow, and pressures on wildlife to similarly grow. So what should our response be? Should it be business as normal? First let us consider rhino horn. As demand for rhino horn increases, as prices increase, as poaching becomes ever more professional, more determined and more ruthless, do we simply gear up by doing more of the same? If you think that the answer is “yes”, then I refer you to the comment attributed (or misattributed) to Albert Einstein – “Insanity is doing the same thing over and over again and expecting different results”. Engage in international trade in rhino horn. Ideally this would be under CITES approval with international monitoring and audit procedures in place. Alternatively, if blocked by the CITES member states, it should be despite CITES, and then transparent monitoring and auditing becomes even more imperative. To achieve this, a national dehorning of all rhinos would take place in national parks and on communal and freehold land, on a two to three-year cycle. Each removed horn, as well as all stock-piled horns, would be micro-chipped, a DNA sample taken and a passport issued. Horns would be strategically released for sale to pre-approved buyers under a de Beers type marketing system. The passport would accompany the horn throughout its life. A small royalty would be taken on each sale to cover the cost of dehorning (done by nationally approved teams), DNA analysis, storage, management and sales. The bulk of the horn value would revert to the owner or custodian of the rhinos from whence the horn came, i.e. to the national parks, to communal conservancies, to private owners and to MET for custodian rhinos. Current approaches to black rhino ownership should be relaxed to allow private and communal ownership, as is the situation with white rhino. Freeing up legal wildlife markets inevitably delivers conservation dividends. Custodians and owners of land should be encouraged to expand their wildlife operations to include both species of rhinos (where habitat is suitable), and land under livestock should be encouraged to expand to include wildlife with rhinos. In reality, no real encouragement would be needed, as market forces would provide all the necessary incentives. So support should be offered, e.g. AgriBank could expand its loan facility to allow farmers to invest in rhinos and other wildlife under approved business and management plans that include adequate levels of wildlife expertise. Land under wildlife with rhinos and with an international trade in rhino horn in place would generate far greater returns per ha than any other form of land use, short of finding a diamond-rich Kimberlite pipe on your land (the diamond resource would be depleted over time, but the rhino horn resource would grow). I have estimated that an international trade in rhino horn would contribute close to N$2 billion per year to the Namibian economy, and this would grow as rhino populations expanded. Tax revenue to the state would be significant. A legal trade in rhino horn would help enable land reform, create jobs, address rural poverty, help adapt to and mitigate climate change and mitigate many other challenges. In short, there is no other natural renewable resource that comes close to the value of rhino horn that would prosper in the semi-arid and dry sub-humid regions of Namibia and Africa. Dehorning of the national rhino herd would significantly reduce the incentive to poach – the risk-to-reward ratio would be heavily skewed towards high risk and low reward, and the markets would simultaneously be well supplied with legal horn. Some people have said that there may be an increase in rhino calf mortality in areas with lions and spotted hyaenas if rhino mothers don’t have horns. The data is equivocal. Based on limited sample sizes it is not statistically confirmed that calf losses are higher to mothers that have been dehorned. And even if the losses were somewhat higher, this would be largely insignificant against poaching losses of adult animals. Legalising the rhino horn trade would bring many buyers into the open, where their businesses would be legitimised. At this point I would like to differentiate between tiger (and the substitute lion) bone industry and that of rhino horn. Rhino horn is a renewable resource. 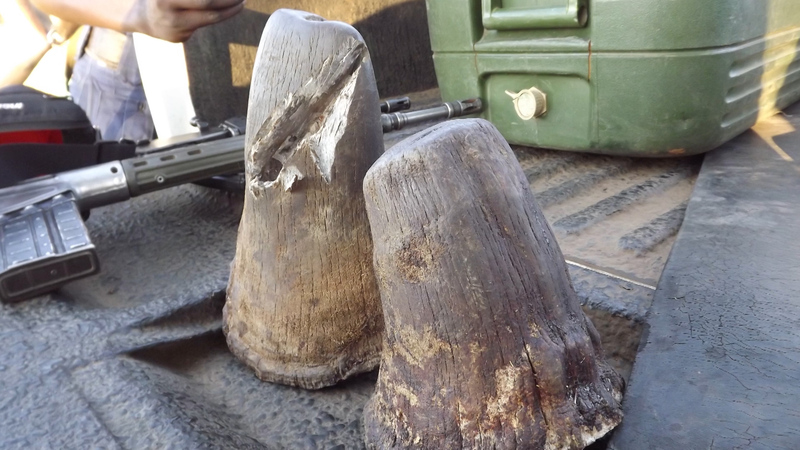 It can be harvested without harm to the rhino – the horn simply regrows. While this is happening, rhinos fulfil their ecological role in the environment, breed and, through their huge value, safeguard landscapes under natural vegetation and provide collateral protection to other indigenous biodiversity. And if this initiative is strategically linked to incentives for open landscapes, it could turn around the harmful game fencing mania we currently face, where the landscape is fragmented and wildlife populations become increasingly isolated. Indeed, the value of rhinos and their horn could be the economic driver for a rewilding of much of Africa. Africa could then really build on its global comparative advantage – its wildlife – as a core plank for long-term development. By contrast, there is no moral or conservation value to be had from the tiger / lion bone industry. It is a very unpleasant, corrupt industry with huge animal welfare issues. South Africa has done itself severe reputational damage by its engagement in the lion bone industry and its legalised sales quota of lion bones to Asia. Namibia should steer well clear of any such trade, with severe penalties for transgressors.